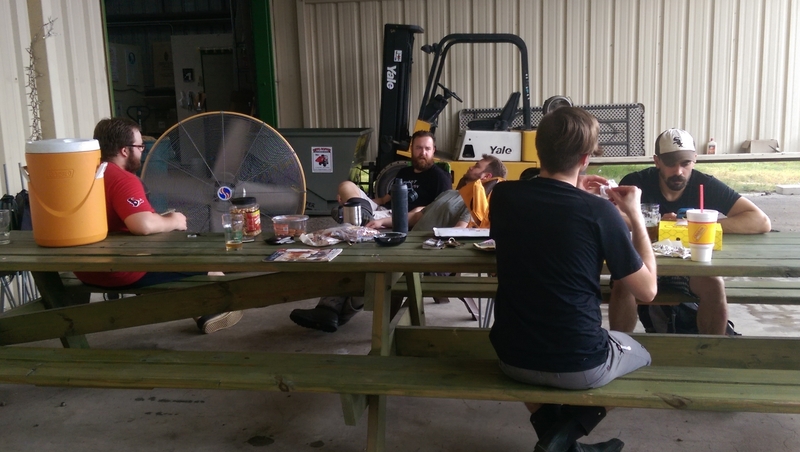 Recently, I had the good fortune to visit the Lone Pint brewery on a day they were brewing a double batch of their soon-to-be-world-famous Yellow Rose IPA. I showed up just after they were done sparging the first batch (see the vocab lesson, below, about all the funny words I am about to use). Since the mash tun had yet to be cleaned and the boil was still a while from starting, Blake Niederhofer (co-founder, co-owner, and the day’s brewmaster) was able to take some time out of an otherwise very busy day to show me around the brewery and tell me a little about what goes on there. 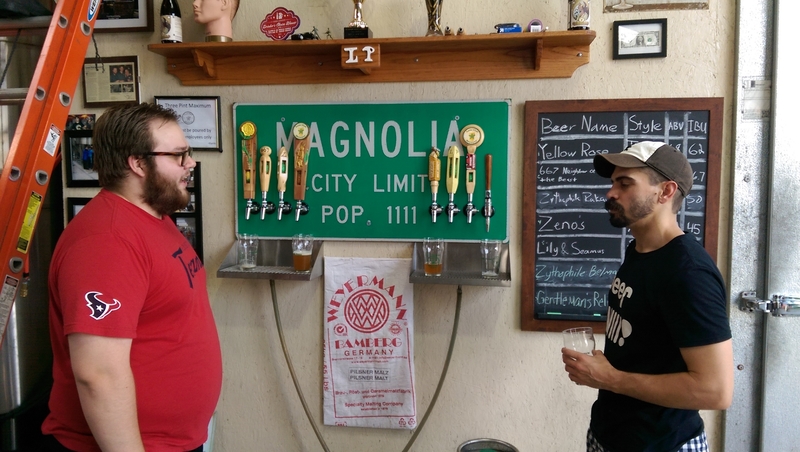 Even though one can find Lone Pint beers in many venues and stores around and outside of the greater Houston area, it still is a very small operation. 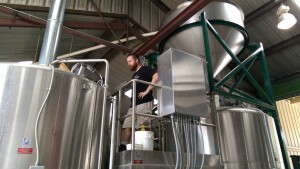 Founded in 2013 by Trevor Brown, Heather Bolla, and Niederhofer, the three got the operation underway while still keeping their day jobs and brewing only on the weekends. After a recent expansion, one can now find folks brewing on weekdays, cranking out 60-90 barrels (1860-2790 US gallons) per week. Even when Lone Pint is not brewing, everyone there stays quite busy kegging, bottling, cleaning, conducting their Saturday tours, and taking care of the other approximately 9.7 million jobs involved in running a brewery. With further expansion planned, the work and Lone Pint’s availability only will grow. 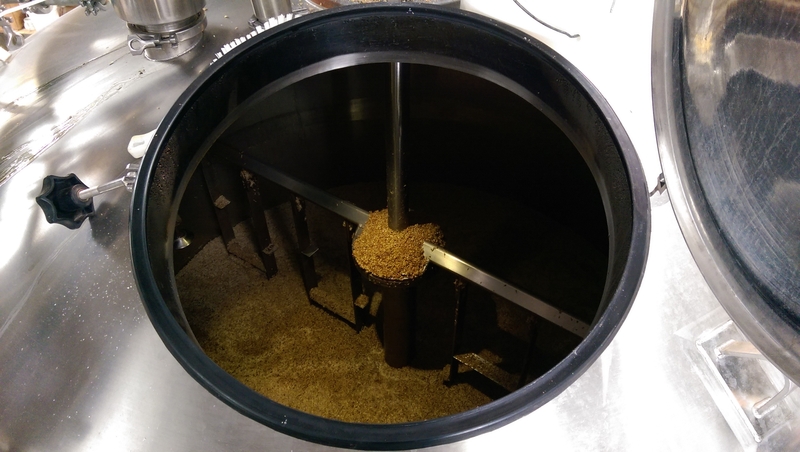 For those that do have never visited an operating commercial brewery, it is not like some club house where a bunch of guys smile, laugh, and toast numerous pints over the course of a day. It is real work, hard work, something like running a commercial kitchen but with a lot of heavy lifting. 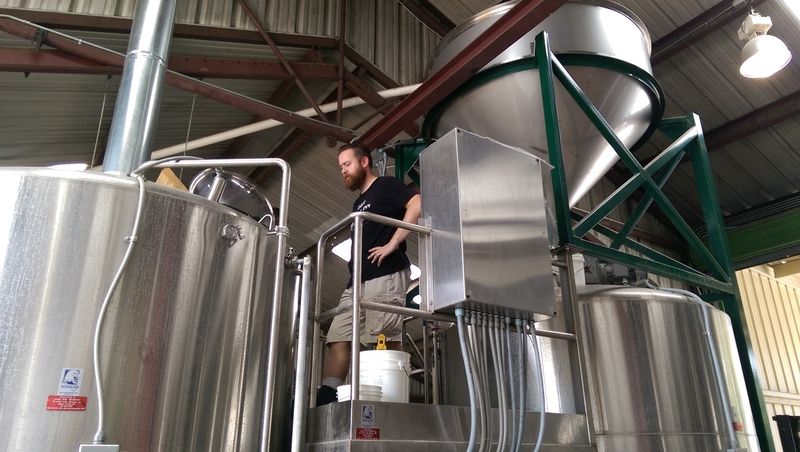 Put best by a former brewer from Fuller’s I once met, “there is no work harder than brewery work.” While I am certain some other professions may legitimately argue that assertion, no one can deny how hard any floor brewer works. The folks at Lone Pint are no exception. They have the passion required to make the sort of beer that so many are praising so highly. The owners and employees are not the only one passionate about Lone Pint, either. 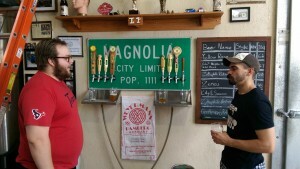 Many fans go out of their way to visit the small, Magnolia brewery every Saturday. A local dentist, who visits often, even hard-carved many of the taps used to serve the beer straight from the cold room (that once served as the paint room for the body shop that used to occupy the premises). Some of the gents working were even volunteering on their day off from their regular jobs. It is a passionate person who wants to clean out a mash tub on his day off. Fortunately, Blake and two volunteers (Dylan and Brandon) were able to take a little time and show me around the beers they currently had on offer. 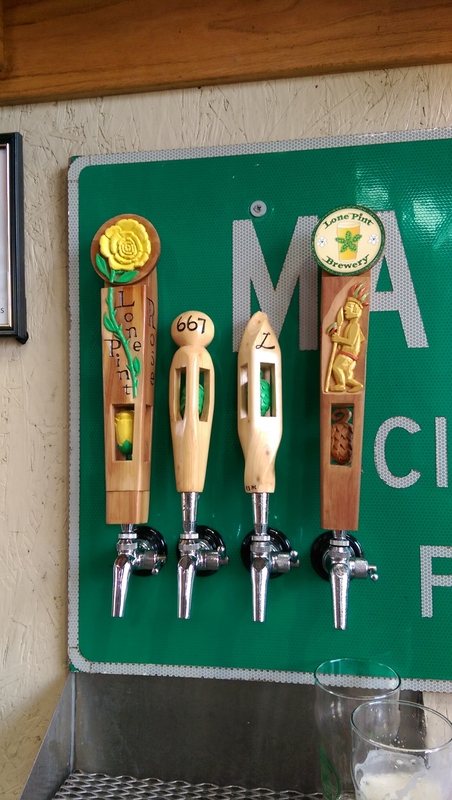 The Yellow Rose that everyone raves about is a crisp, hoppy SMaSH (“Single Malt and Single Hop”) brewed with Weyermann Pilsner malt and ample late addition mosaic hops (currently a darling in the craft and home brewing worlds). Zeno’s Pale Ale is a similarly hoppy American Pale Ale with a lightly softer and rounder malt character. 667 Neighbor of the Beast is a full-fledged American IPA with a strong and complex (but not overwhelming) malt backbone to support and compliment the powerful hop aroma and flavor it delivers. Gentleman’s Relish is an English Brown Ale that is a maltier, nutty departure from the hoppy, hoppy beers and absolutely delicious. Lily & Seamus departs in a different direction with a healthy dose of wheat and a sour mash to shape a more refreshing beer, and one of the beers I have ever tasted that successfully blends hoppy and sour notes. The unusual offerings on tap that day were from Lone Pint’s “Zythophile” line, a series of beers that are limited batches with new, rare, or experimental hops. I was lucky enough to try both the Rakau (from New Zealand) and Belma. The Rakau was complex and rich with fresh stone fruit (peach and apricot), accented with a touch of piney resin and herbal notes (we talked about rosemary and sage). The Belma was more tropical and purely fruity (we were kicking around words like “strawberry,” “fruit salad,” and “melon.” Upon a return trip, I was treated to the Po-Cha-Na-Quar-Hip braggot, a combination of mead (honey wine) and beer—something nearly impossible to find from commercial breweries. The annual release, named for a Texas Comanche War Chief is made with traditional American malted barley, local honey, and just enough hops to balance the sweetness. I hope to see you out there, sometime! last few years) how in the world can we call a beer both “black” and “pale” at the same time. You know you’ve done it. We all have. Chances are we will again. 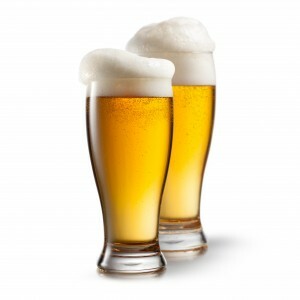 beer, any beer, for what it is.